CARICOM 10 k winners Cleveland Forde from Guyana and Linda Mc Donald from St. Vincent and the Grenadines pose for a photo with Minister in the Ministry of Sports, Guyana, Hon. Nicolette Henry. CARICOM Chairman and Prime Minister of Dominica Hon. Roosevelt Skerritt and Secretary General of CARICOM Ambassador Irwin LaRocque after the twelfth staging of the event on Sunday July 3, 2016. Four time CARICOM 10 kilometre winner Cleveland Forde of Guyana copped his fifth title in the latest edition of the CARICOM 10k Race on Sunday morning (July 3) in his native Guyana, the Caricom Secretariat said in a statement. He completed the race in 32:39 minutes. Linda McDonald brought victory to St. Vincent and the Grenadines in the female category with a time of 37:57. The second place in the male category went to Curtis Cox of Trinidad and Tobago clocking in at 32:56 while Winston Missingher of Guyana raced to third place with a time of 33:28. This was the twelfth staging of the CARICOM 10k race which was held under the theme “Promoting Healthy and Peaceful Societies”. The start line was the CARICOM Secretariat, while the end point was the Guyana National Park where a presentation ceremony was held. In addition to the main event, there were three supporting events – a 5K race, a 1500m race for schools, and a special race for athletes with disabilities. “All levels of society need to be involved in physical activity to prevent CNCDs,” Prime Minister Skerritt said. 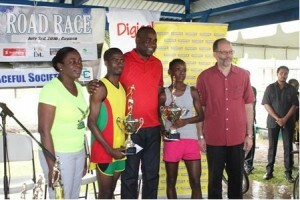 Guyana’s Minister of Sports, Hon Nicolette Henry said it was wonderful to see the high number of participants. She said those who participated were examples of how commitment and dedication pays off for health and well being.